Several close friends are getting married this autumn, causing me to think about those qualities which certain gowns have to create an indelible imprint on our memory. The magic and romance of wedding gowns - lace, beads, pearls, silk, satin, organza, taffeta - is often rooted in vintage styles from NeoClassical white lace and silk, to rustling Victorian taffeta encrusted with embellishments, to 1920s beading on sheer silks. One current line to watch is Essence of Australia. An international concern with growing North American markets, Essence clearly understands the needs of the modern bride, blending both the timeless allure of luxury fabrics with couture styling. 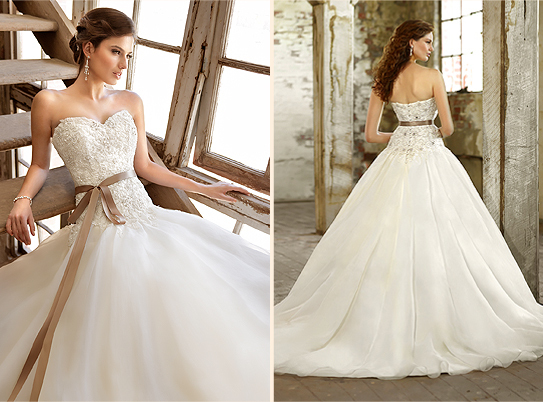 Exquisite beading is one of their specialties and they offer customization of a number of the gowns for a perfect fit. Two gowns shown below feature taffeta, organza and lace with French satin ribbon for optional sash. The photos say it all. Myra's 1816 Black Canton Crepe Gown: "seven yards of an ordinary quality"
Approximately a dozen typescript letters (source unknown) written primarily by Myra Montgomery (October 1, 1794-April 14, 1817) to her cousin and subsequently, fiancé, Horace Henry Goodman (December 22, 1785-January 3, 1849) survive in the Collections of the Haverhill Historical Society, Haverhill, NH. Although small in number, the letters nonetheless constitute a valuable source of information on a relatively affluent young woman in the early Republic. 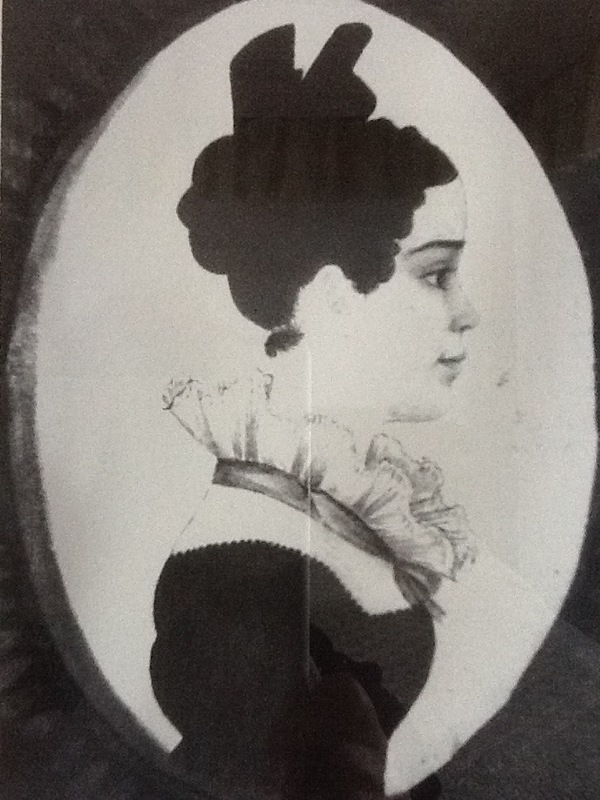 While living in a rural town, she had access to much wider intellectual, artistic and literary circles, through her Boston education at the progressive Mrs. Susanna Rowson's School and due to Haverhill's role as the seat of the North County Court system, which attracted several hundred individuals throughout the year. This short excerpt is part of a larger article on her life and letters, which have never been published. Portions have been presented in academic symposia over the last decade. "....When you were here I did not think I should find a black canton crepe gown necessary, but it will be very useful for common wear & I have enclosed what I suppose is sufficient to purchase seven yards of an ordinary quality at least. I have been informed that they are very low." Her mother had died just five weeks earlier on April 21. The use of the black Canton crepe (or crape) for a "common wear" gown, would have been in keeping with the transitional neoclassical into regency style of the time. The knowledge of current high style fashion is further supported in the family silhouette, seen above. Note the wide set sleeves, square cut bodice and emphasis on the high Neoclassical waist, gathered just below the bust. 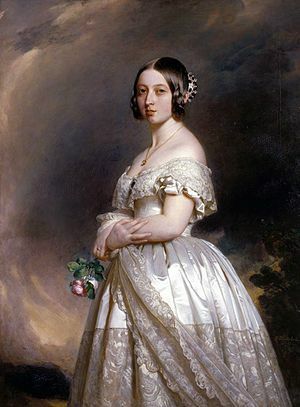 The dress is offset by the elegant standing white lace "collar" with ribbon, her curled and well coiffed hair (perhaps with a center part), sporting a hair comb or accessory. With her hair piled high, gathered at the crown of her head, neck exposed and the cut of the dress, the profile is long, simple and elegant. In her next letter, she thanks Horace very much for the trouble he took to get the fabric but notes that it was not enough and she has asked Mr. West to procure some more. Mr. West was her brother-in-law and had a shop on Long Wharf in Boston. Horace had recently joined him in partnership. Indeed, the direct connection to goods coming to wharves of Boston and finding their way to northern New Hampshire within a matter of days is of interest and is oft repeated in the letters between the young couple. The death of Myra's mother, Elizabeth Ring, foreshadows her own: Myra became ill in November of 1816, and succumbed to consumption almost exactly a year after her mother's death. She died on April 14, 1817 in the house where she lived most of her short life. The importance of Horace's Boston business is in strong evidence: as her illness took hold, he sent Maderia wine and fresh oranges in the hope that Myra would recover. 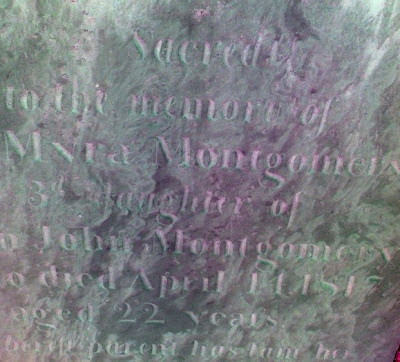 You can visit Myra's burial site, along with that of her father, General John Montgomery, her mother and step mother, Patience, at the Ladd Street Cemetery, not far from where her home still stands along the Oliverian Brook at the junction of Routes 10 & 25 in Haverhill, NH. Sources on Neoclassical and Regency garments is extensive and widely available on line and in print. 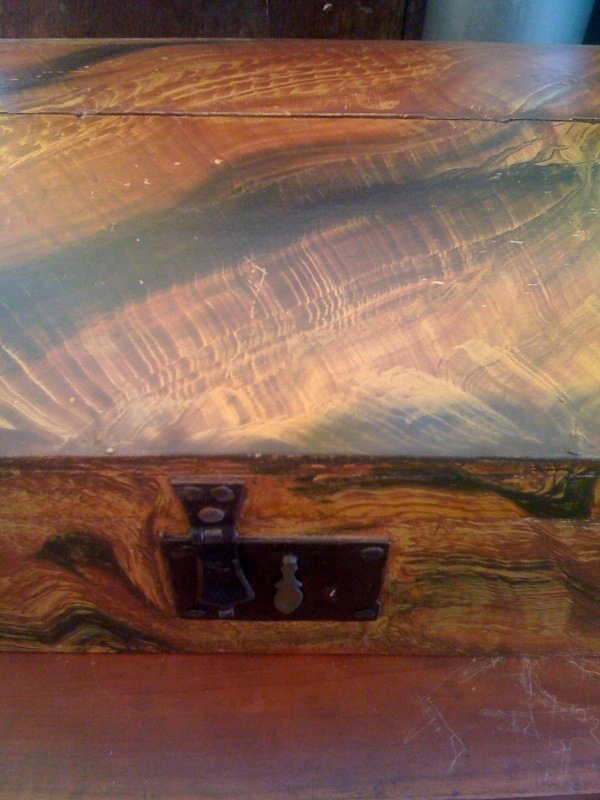 A personal favorite is Ackermann's Repository of Fashion, first published in 1809. Friday, September 14, 5-7:00 PM. Twenty-five Victorian era garments and accessories from the UNH Irma Bowen Textile Collection will be on display. Join Guest Curator, Astrida Schaeffer, in an exploration of the aesthetics of nineteenth century clothing design and a close-up look at how their embellishments were constructed. The accompanying book, published by Blue Tree, with sumptuous photography by Brian Smestad and detailed instructions by author Astrida Schaeffer, provide insight and inspiration for reviving these techniques. The exhibition is sponsored by the University Museum, Blue Tree, and Fabric Place Basement and funded in part by the E. Ruth Buxton Stephenson Memorial Fund and the UNH Center for the Humanities. For parking and hours, please see our visitor information. While much has been written on Queen Victoria (1819-1901) and her 1840 wedding dress as a statement of politics and power (rather than "purity"), not surprisingly, the author has decided to examine her wedding shoes. 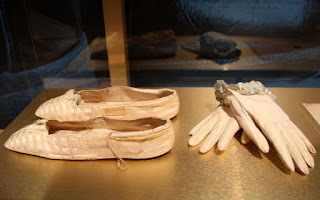 Just as her wedding gown was extensively adorned with fine British-made Honiton lace (in an effort to support the decimated lace industry, which proved a successful tactic for a time), so, too, were her shoes a decidedly British product. Created by Cundry & Sons, they are a highlight of the newly refurbished Northampton Museum. 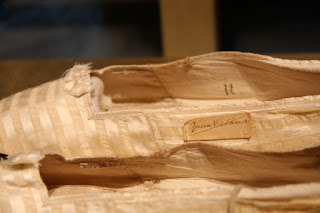 Made of white satin, they feature ribbon ties which wrapped at the ankle to hold them in place. The affixed label is very traditional, as is the form and the use of many fonts. The label is a proud "brand" of the company, listing (cramming, actually) as many royal clientele as possible into the oval. Note that they first list themselves as "bootmakers." 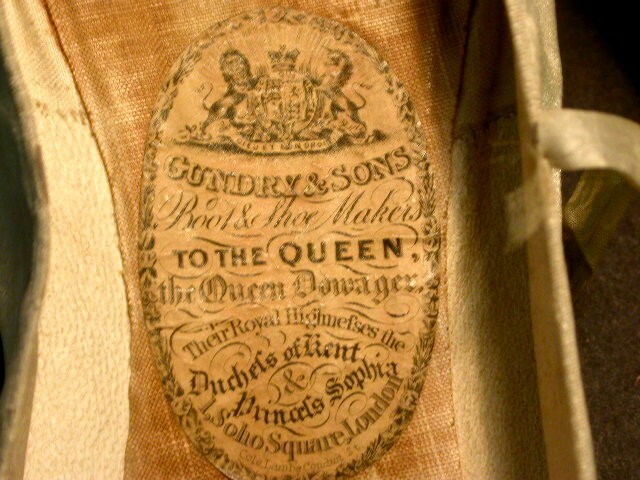 This remained the highest echelon of cordwainer, even in a prolonged era of important women's shoemaking--of which Queen Victoria's represent the epitome for any designer. We need only to look at last year's royal wedding, the 2012 Olympics or even the wardrobe of American First Lady, Michelle Obama, to understand the significance of nationality in designer selection. Some garments and shoes have a timeless appeal spanning centuries, despite shifting ideas of style and comfort. 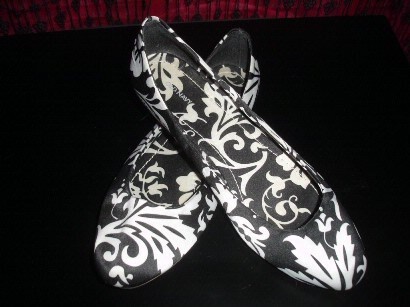 These flats, first brought to my attention by Tara Vose and Julia Roberts for their Victorian accessories exhibition at the Colonel Paul Wentworth House in Rollingsford, NH, exemplify this. 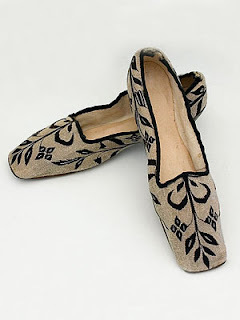 While searching for examples of historic garments and shoes, the pair of shoes pictured below (on www.vintagetextile.com) caught my attention. 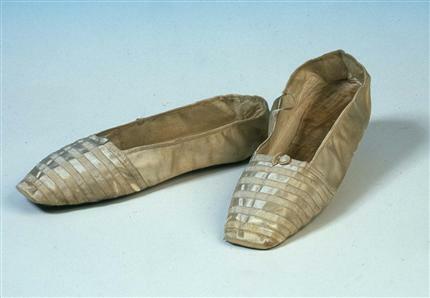 The information notes: "Silk faille shoes from a Woodstock, CT. Estate, c.1830-1850." (Sorry, folks, they have been purchased according to the website!) While the geometry and stylized motifs are not as powerful in the Connecticut pair, they certainly share a sensibility. It is of course, not surprising to find such similar pairs of shoes during the industrial age of factory or partial factory production, but they are intriguing nonetheless. Most likely from New England, the flats may speak to an aesthetic mindset as well. Locating two pairs of strikingly similar flats also underscores the value of digital age imagery for scholarly research - it would have been unlikely that two pairs of shoes from private collections would have found their way so quickly onto the same page for comparison even a decade ago. September is now upon us. despite looming publication and symposia deadlines. It has been a truly fabulous summer in northern New England, one worth savoring as much as possible. Below find a personal scrapbook of vernacular Federal architecture; newly "discovered" manuscripts and textiles; auction finds and views of the Connecticut River Valley as it winds along River Road in Lyme and Orford, NH. Hand painted, grained small chest, www.steenburgh.com. Labor Day Weekend Auction, East Haverhill. River Road Cemetery with various stones for Revolutionary officers and local families.